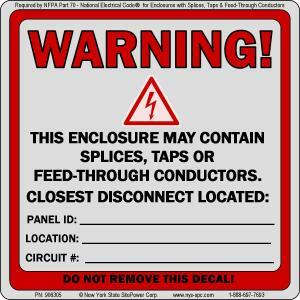 Reflective Feed-Through Conductor Warning Decal - *NEW* As Required By the latest edition of NFPA Part 70 - The National Electrical Code. Required for generator installations. Approved by Electrical & Building Inspectors. Sold as a single decal. Same Day Shipping! As required by the latest edition of NFPA Part 70 The National Electric Code. 3M Reflective Feed-Through Conductor Warning Decals meet the requirements of Articles 312.8 (3) for the identification of Feed-Through conductors. Where to use: This decal should be used on generator installations where a "select circuit" or "pre-packaged" transfer switch is used or any switch or overcurrent device that may contain taps, splices or feed-through conductors. The decal should be placed at the equipment where these conditions are present. 4"x4" size fits anywhere on service equipment.